Buy the Tippmann Cronus Tactical from Amazon, NOW! 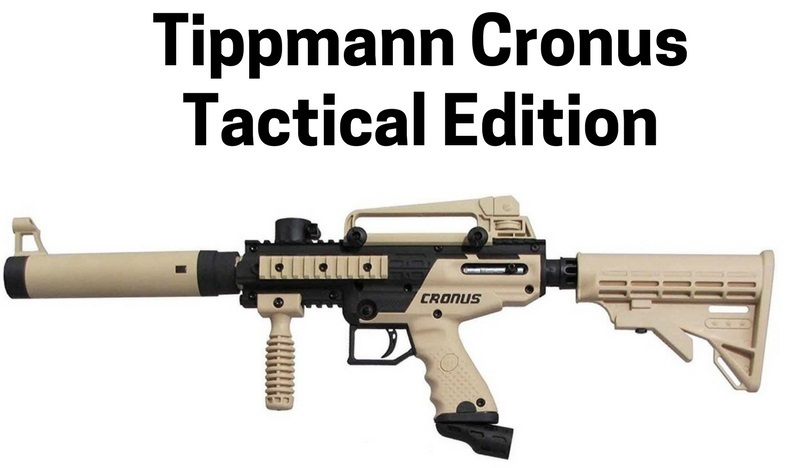 At just over $100, you are not going to find guns more robust than the Tippmann Cronus Tactical edition. True, the “tactical edition” is only a cosmetic addition in the sense that you get a carry handle, fore-grip and stock but it completely changes the visuals on the gun, making it look like an M-16 rather than the bare bones Cronus. These guns are so durable that many paintball venues buy it as a rental gun. Everyone knows how rental guns are treated and the fact that these have been bought as rental guns means that they can take a beating and still be very reliable. If you are a beginner or an intermediate player who never used a paintball gun before or used something very basic like a pistol or a Kingman, this is going to take you by surprise, with the power it has to offer. You can easily group your shots on targets that are 75 feet away, something you can only begin to say of guns that cost $200 and more. Beyond 75 feet however, you are going to need a barrel upgrade if you want accuracy. Tippmann’s tried and tested in-line bolt system prevents chopping and you can shoot all day long without chops, even if you are using rather dodgy paintballs that aren’t in pristine condition. The packaging is very basic and the guns comes in a box with a toolkit that include o-rings, oil, a barrel sleeve and Allen keys that can be used to take the gun apart. If you want to extend your Tactical Cronus’s range to about 125 to 150 feet, you are going to have to replace the stock barrel. We highly recommend the 16′ J&J Ceramic Barrel for just $40. It fits just fine under the Tippmann Cronus’s suppressor and increases accuracy at all ranges. You will notice that your shots are a lot straighter, with bends a lot longer after how you were shooting with the stock 9′ barrel that the Cronus tactical comes with. We actually used this barrel and decided to use the Cronus Tactical as a mid-range sniper rather than as an assault gun, as we found that we could sit back and take out opponents at the 100 feet range, with very reliable accuracy. Please note that there are even 20′ barrels from J&J for the Tippmann Cronus Tactical should you need it. But, remember than longer the barrel, the more distance you lose, with increased accuracy in the near range. Another nice thing about the J&J barrel is that you can just shoot your way out of a paint jam if you ever chop a ball. The Cronus Tactical very rarely chops balls but having this barrel on will allow you to just shoot your way through and be back to normal in a matter of seconds. We however do recommend that you rather clean your barrel out rather than shoot through it. To sum up, the Cronus Tactical is a fantastically reliable and fairly accurate gun. A $40 barrel upgrade will make it a very accurate gun as well, especially for the modest money you shell out. The hard composite build and reliable internals mean this gun can take a lot of throwing around and still be your old faithful during paintball battles for many years to come! Ready to buy it. Buy it on Amazon now. Amazon always has the best price on the Tippmann Cronus!